Should you restore your instrument? 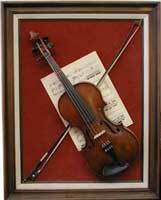 It’s not just professional-quality instruments that merit restoration. If your instrument has sentimental value for you, then it may be worth investing a few hundred dollars so it doesn't continue to fall apart and die. Did you inherit your grandmother’s violin, but nobody in the family is going to play it, or it’s too badly damaged to restore? Then we can set it up in a beautiful frame or shadow box — and a playable instrument can be connected in the frame so that it can be removed when you want to play it. We can supply a written estimate of what it will take to bring your instrument back to life.